Watch World's Champion carriage driving competitor Karen Waldron discuss and demonstrate the elegant, historic sport of carriage pleasure driving. Carriage pleasure driving combines a long and storied past with opportunities to drive both competitively and for pleasure. Many who show today use antique carriages that hark back to driving’s grand historic tradition. Known for the camaraderie of its participants and its openness to all breeds of horse and pony, carriage pleasure driving is a sport for equestrians of all ages, whether they prefer driving a single animal, a pair, or more, and the sport features a range of classes judged on a variety of criteria. 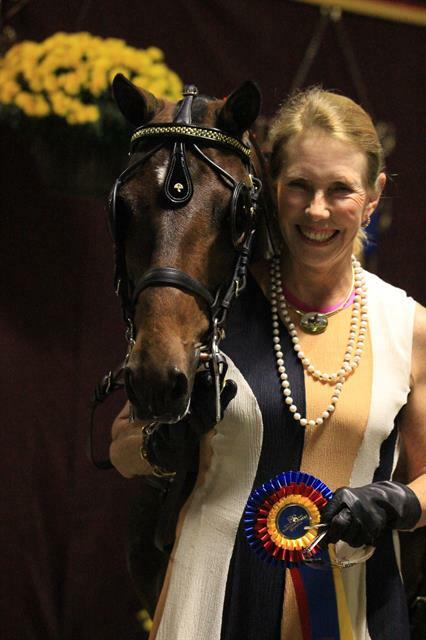 Karen Waldron, a longtime carriage driving competitor and the winner of numerous World’s Championship and Canadian Championship titles, owns Bent Tree Farm in Shawsville, Va., with her husband, vaulter Shawn Ricci. Waldron has operated Bent Tree since 1973, first as an American Saddlebred training farm and now as a renowned Hackney and Friesian breeding and show facility, as well. Since 2012, Bent Tree has focused on carriage driving, dressage, and Warmblood vaulting horses. Waldron also is a certified Pilates instructor and developed the equiBALANCE equestrian Pilates and fitness balance program, which she and Ricci offer through a specialized facility at Bent Tree, the Center at Walnut Grove. Waldron serves on the USEF’s Carriage Pleasure Driving Committee. In 2010, she was inducted into the American Hackney Horse Society Hall of Fame. Photo of Karen by Bob Funkhouser. Follow Bent Tree Farm on Facebook and Twitter.